This article is an adaptation from the Chapter: Introducing your Baby to your Dog in our upcoming book: “The World According to Dog”. Introducing your newborn baby to your dog requires careful planning in advance. Consider early introduction by playing tape recordings of baby sounds so your dog can get used to the shift in noises that will accompany your baby’s arrival. Invest now in the diaper disposable bin, baby lotions, wipes and powders and introduce these new smells to your dog before they will be put to use. Dogs process a considerable amount of data through their snout, so allow them the advance detection process by bringing these new smells into the home well in advance of when they will actually permeate your rooms and hallways! You can also begin “simulation” of new-life activity by walking your dog with an empty stroller, rocking in the empty chair you plan to use for baby, standing at the changing table and pretending to diaper your baby. You may decide to keep your dog out of the baby’s room, which is entirely up to you and completely O.K., yet your dog should not be relegated to extreme confinement or isolation once your baby moves in. Provide his own private retreat room where baby will not encroach. Including your dog in the daily activities of nursing and rocking a baby to sleep can be accomplished with a little training ahead of time. Designate a special “go-to” place in the same room the baby will occupy. Provide a pet bed or mat and teach him to “go-there” by standing next to the pet pad and provide a treat each time he complies. Then establish a release command (okay! release!) and toss a treat so he has to leave the mat to retrieve it. Repeat this process, gradually increasing the time he stays on the mat, so he learns to sit or lie down patiently in this special spot of the baby’s room. This will encourage positive family interaction by including your dog in the daily marathon of round-the-clock baby care. Just before you bring your new charge home from the hospital, let your dog sniff the baby’s blanket or clothing for the smell about to permeate the home. You should greet your dog alone before entering with your swaddled bundle. You want to slowly introduce them and maintain cautious distance for a few days as your dog adjusts. Allow your dog to approach the baby, when he’s ready and do not overact with fear or “shoo” him away when he does. You need to be calm and controlled during that first sniff. You want your dog to accept this new invitation to the household and be confident that he hasn’t lost his place in the family hierarchy. Continue to praise and provide daily affection to your dog. 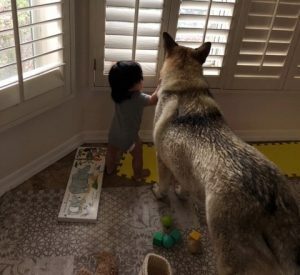 You’ll be busy with baby and undoubtedly sleep deprived in the first several weeks; if Fido is ignored in the process, he might resent this “intruder” with negative consequences as a result. Don’t punish your dog if he plays with baby’s toys (easier if he has his own to choose from). Provide dog treats while feeding your baby. Take walks together as a family. If you can’t manage the juggling of baby and dog, hire a dog walker to make it easier on you and still maintain routines and positive stimulation for your dog – something just for him that allows exercise, mental enrichment and his own break from baby’s squeals. You want your dog to make positive associations with baby interaction. When your baby is sleeping, don’t lavish attention and go guilt-ridden overboard with your dog when it’s quiet. When your newborn cries (her own howls to signal a need), toss treats at your dog at the same time. The idea is to create the expectation that when baby is awake and vocal, fun things happen! While the two of them should never be left alone together unsupervised, there are many testimonials to the profound dog-baby relationship found on-line and captured in professional photographer’s journals. Your dog is a natural family protector and guardian and likely to accept his new human sibling as an important family asset; with some mindful preparation in advance on your part; as the ultimate Pack Leader.